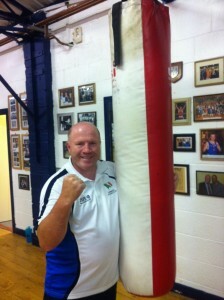 The Liberty’s Ryan Nugent sat down with Irish Olympic boxing champion Michael Carruth to discuss the Dublin-born athlete’s road to Olympic gold, his local club’s anniversary, coaching and the future of Irish boxing. “I was torn between blessing myself and jumping around like a crazy horse. As I’m sure you’ve seen outside, I chose the latter,” said Michael Carruth, of his reaction to winning gold in Barcelona ’92. We’re in Carruth’s office, where he had to clear out a group of five people to make room for this young reporter. “It seems like I’m always having meetings here, meeting after meeting,” he says. We’re at Drimnagh Boxing Club, where Carruth was nurtured into the Olympic champion he became, and where he, since his retirement spends most of his free time and more, giving back and volunteering. The outside he’s speaking of is the gym and training area, where facing you on the wall upon entering the club are two prominently framed photographs of that famous victory over Juan Hernandez in 1992, almost as prominent as Carruth’s presence within Drimnagh boxing, past, present and future. Yet it’s not his boxing beginning that’s our first port of call, it’s not the “David v Goliath” encounter with Hernandez, but the breakthrough in Moscow’s 1989 World Championships, where heart-breaking trauma in his family life inspired Carruth to a bronze medal and in turn a firm belief of being capable of “messing with the best,” as he puts it. “It was a difficult time for my family, my nephew drowned in Blessington lakes, a few months beforehand. I wanted to cheer my family up. I pushed myself so hard that I nearly made myself sick,” says Carruth. “I was the only Western to win a medal at those championships. That was the main turning point in my boxing career. I messed up in Seoul at the Olympics the year before. “I was still fighting at 60kg at that stage and because I was getting older and inevitably bigger, it was too big of an ask for me to stay at that weight so I wasn’t eating or taking in much fluids for three days to get through the weigh in. “In boxing terms, Seoul was the worst moment of my life, but I didn’t prepare half the way I should have. I realised the importance of fighting at the right weight and moved up one for Moscow and then another for Barcelona in ’92,” he says, still with a tinge of disappointment in his tone. What caused immediate confusion upon my entrance into Drimnagh Boxing Club on that Monday evening was the presence of two Carruth’s, two identical Carruth’s. “I’m Michael, he’s Martin,” I’m told. “Don’t mind him” says another guy, “he’s Martin, that’s Michael.” Thankfully William, the third triplet, wasn’t present. Carruth, a big Dublin GAA supporter, was invited to the 1992 All-Ireland Final between Dublin and Donegal as a guest of honour, but the plush setting of the Hogan Stand was not quite his style. ““I wanted to go with to my mates on the hill, so they actually brought me across the pitch and onto the hill and the reaction I got from the supporters is something I’ll never forget. Another story in Irish sporting folklore was of the price of beer dropping to that of 1956, on the day of Carruth’s fight, with that being the year of Ireland’s previous Olympic champion, Ronnie Delaney. Carruth defeated Mikaele Masoe in the last sixteen, beat Anreas Otto 35 to 22 in the quarter final and was a convincing victor over Arkhom Chenglai in the semi final to guarantee at least silver, and then came up against Hernandez in the final as the overwhelming underdog, where sports broadcaster, Jimmy Magee, believed he had to alter his style from previous fights. “We decided that it was best to let him come at me, and that what I did. I just tried to pick him off and when he knew he was in trouble in the third round (level at 8-8 after second), I just kept calm and held onto my advantage,” says Carruth. “I was the first Olympic Gold medallist, I don’t want to be the last,” insists Carruth. The 47 year old believes that although the qualification process for Olympic boxing is getting increasingly more difficult, the Elite Performance Unit, which pays and coaches Ireland elite boxers on a full time basis, is not producing, given how long it’s been in existence, but why? ““I don’t know. They’re not good enough, I suppose. We’ve two silver and about seven bronze in the men’s, so they’re getting closer, but not close enough. They should be always knocking on the door in finals,” he says. “If we get them there (Olympics) we tend to perform. If we get 4/5 men there…I think we’d be lucky. However, if we do get them there, we’ll probably come away with a medal. Katie (Taylor) should retain her gold medal. If we’ve only two or three boys, we’ll be lucky to get one,” insists Carruth. “This is a voluntary basis. Anybody on that floor, from the first session to the second session is all on a voluntary basis. 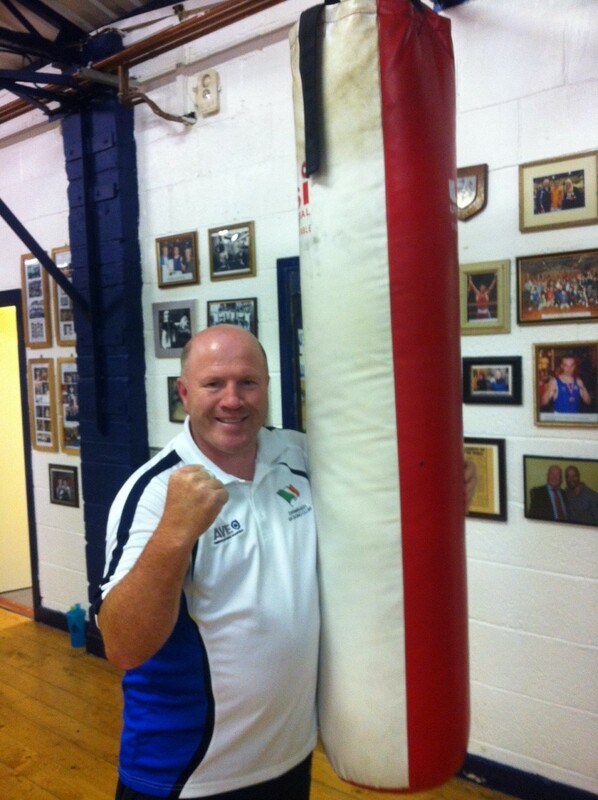 Carruth has been involved with Drimnagh boxing since the late 70’s, when his father, Austin was coaching, and if he can replicate some of what his father did as a coach, he’ll be a very satisfied man. “If I can be a smidgeon of what my father was as a coach, I’ll be doing alright. We’re always trying to learn here. We’re progressing with fitness methods. I want to keep learning and the kids to keep learning,” says Carruth. The progress of the younger generation is paramount to Carruth, and as IABA Development Officer, he has a big say in this progression. That’s certainly a start, and as his writing on the wall beneath those framed photographs says ‘the man, who truly believes he can win, can’.